a 12th Century Thatched B&B and Permaculture Farm. Welcome to Hay Meadow Farm, Bed & Breakfast, Café & Farm Shop. We are a warm, cosy and friendly guest house situated between Holsworthy and Launceston on the Devon & Cornwall border. Hay Meadow Farm is a 12th century thatched manor house with origins dating even further back. Mentioned in the Doomsday Book the farm is stepped in history and the cottage with its inglenook fireplaces and exposed wooden beams is brimming with character. Our bed & breakfast offers a peaceful, warm and comfy level of boutique B&B in a very peaceful setting. Each room is tastefully decorated and very loosely themed around wild meadow flowers. The bedding and towels are 100% natural cotton, mattress that are organic, luxurious and extremely comfortable, even the curtains are handmade from organic hemp. The carpets are pure wool, light fittings are hand forged iron and combined with the wood and stone of the building the feeling of everything being natural adds to the sense of history. Situated in an extremely rural setting the manor house and meadows are very tranquil indeed. Surrounded on three sides by woodland and with meadow on the other you can really get the sense of privacy and seclusion. With some of the darkest night skies in Britain on a clear night you can see the stars in all their heavenly splendour. A warm welcome is always assured. Please do contact us with any enquiries, we will always try to help. Dining at Hay Meadow Farm. Local, Organic, Fresh, Fair Trade and Sustainable. Always freshly prepared. We offer a delicious varied breakfast menu sourced from the best fresh Devon produce. Our café and farm shop will be open soon. Serving delicious homemade snacks & treats. Freshly prepared seasonal menu made from our own or the finest local ingredients. The service we provide here at Hay Meadow Farm is as important to us as the quality of rooms or freshness of the food. Our small team works to ensure that the time spend with us is relaxed and enjoyable. From the luxury of the boutique b&b to the hiring of our camper vans we continue to strive to improve the already high standards of customer service. If you have any questions concerning our services please do not hesitate to contact us, we welcome all enquiries. If you are looking for a cosy, very comfortable B & B with attentive hosts and a large breakfast look no further-you’ve found it! Don’t hesitate to stay here. The other reviews on Hay Meadow Farm have said it all and they are all right – it is as good as they say. If you are looking for a base to explore Devon and North Cornwall this is an ideal place to stay. And if you like beautifully restored cottages in the Old English style this is one of the best I’ve ever seen, complete with large fireplaces. What an idyllic place. 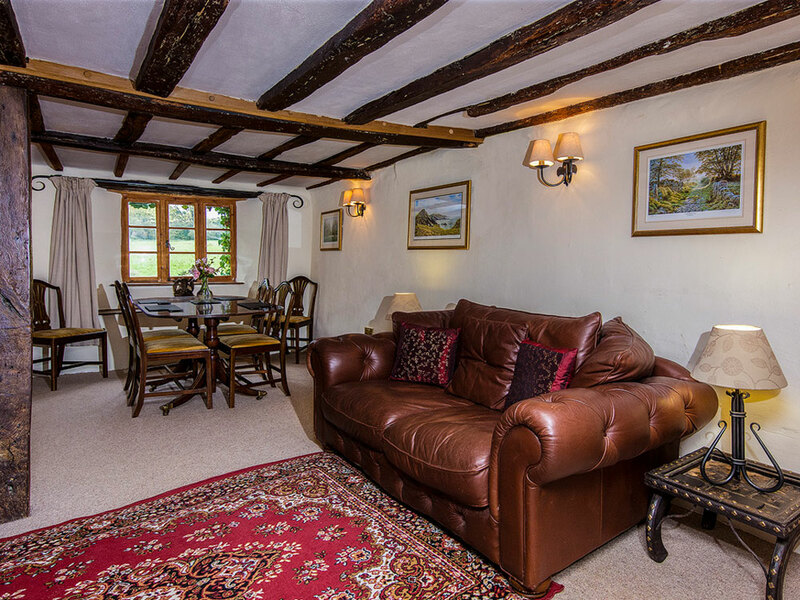 The cottage is cosy and perfect for a break. We loved our room Clover, on the ground floor. It had a log burner and jacuzzi bath. Very comfortable bed and immaculate room. Duncan and Jane were wonderful hosts and our dinners and breakfast’s were superb. Storm Doris raged around us but we were in our own cosy world. Thank you so much for a great stay. Hay Meadow Farm nestles in 20 acres of truly peaceful west Devon countryside, bordered on 3 sides by 250 acres of woodland, there is an amazing sense of seclusion and connection to nature. The meadows have (as far as we can tell) never been intensively farmed so we have an abundance of wildlife and an incredible variety of flora and fauna. A little haven for wildlife and humans to share. Permaculture tackles how to grow food, build houses, create communities, and minimise environmental impact at the same time. Its principles are being constantly developed and refined by people throughout the world in very different climates and cultural circumstances. Our eco building courses cover a wide variety of subject matters, from every aspect of requirement and function including construction, heating, drainage, water collection and power. We also offer workshops on other creative subjects such as how to build a clay oven. Can be used in addition to all other offers, only valid on bookings made via email or telephone. We will, each season run an extra special offer open to ‘Friends of Hay Meadow Farm’ only. Receive invitations to special events open only to ‘Friends of Hay Meadow Farm’. We will email you only once a quarter giving you news and information on the next seasons offers.